The Florida Panthers assembled three continental traveling hockey championships in 2017-18. Though they did not defend them for long, the Panthers still totaled enough championship wins to lead the standings in the end. Unlike most other sports, long winning streaks probably won't carry you through the continental traveling hockey championship, because long winning streaks almost never happen. The longest winning streak in the history of this chase is a 12-game run by the Minnesota Wild in 2016-17. 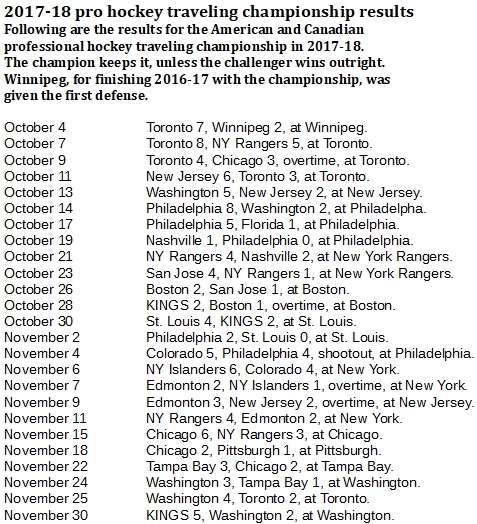 A handful of other teams have won six straight, but that's what passes for a long run of winning in pro hockey. 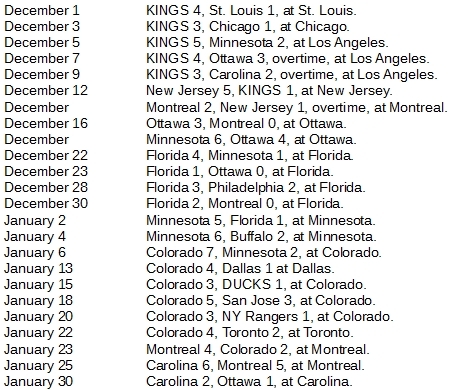 In 2017-18, the Kings and Colorado Avalanche each turned out streak of six wins. It wasn't enough for either of them to finish at the top of the continental standings. That position went to the Florida Panthers, who did it with volume. The Panthers led the standings with three championships, totaling nine games. The Kings and Avalanche each won two titles, with the Kings lasting for eight games and the Avs for seven. A three-game championship for Florida ended with a 5-4 overtime loss at Tampa Bay on March 6. From that point, the top of the standings never changed as the title rattled around through the also-rans for the last month of the season. Among the contenders, only the Panthers even had crack at the title, but they lost, 4-0, on the road to the defending champion Columbus Blue Jackets on March 22. Nor did any of the other remaining games impact the all-time standings, which were tight at the top through 2017-18. 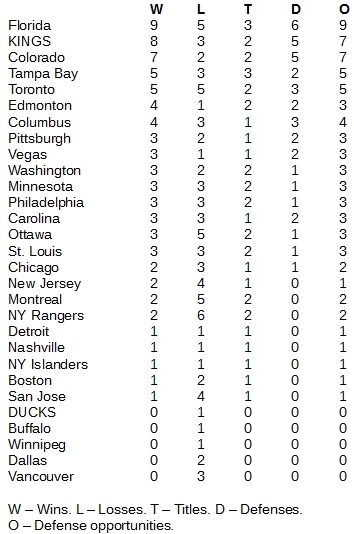 The Wild held the most wins with 18, but the Panthers and New York Rangers were right there with 17, followed by Colorado with 15 and the Kings with 14.